Since joining Twitter in 2009, it has been my favourite social network to engage with my audience. My first ever tweet was sent on the 17th March in 2009, and since this day over eight years ago, I knew that Twitter would be my most engaging platform. Earlier this year I received an email from online monitoring tool Brand24 telling me that after conducting a study based on two million online mentions and more than 4.5 million interactions, I had made a coveted list of the top 100 global digital influencers. Whilst this is based on how I have built my personal brand, and become a thought leader, Twitter has played the biggest part in giving me the platform to achieve this amazing accolade. 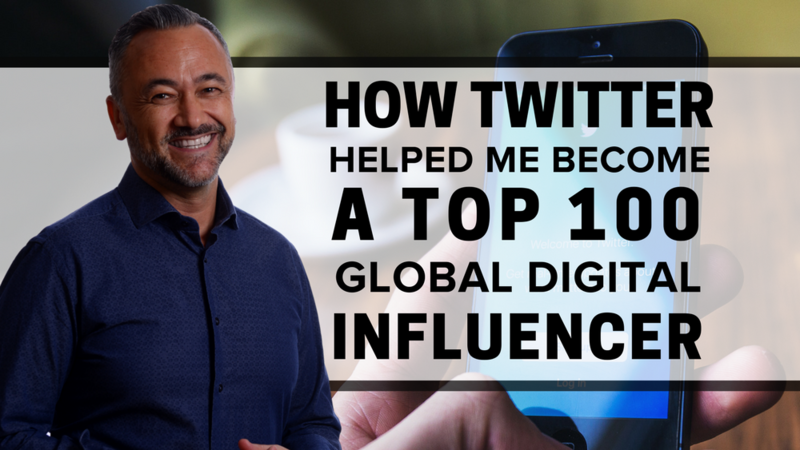 Twitter has helped me become a top 100 global influencer, and I am going to share with you the tips, tricks and strategies I implemented to give me the engagement, brand awareness and following which has lead to my online success as a thought leader. As my entrepreneurial journey changed, so did my target audience. Regardless of whether you have been in business for 24 hours or 10 years, Twitter is full of noise and defining your target audience is just the first step, but you also need to be giving them the experience they’ll fall in love with. Thinking about how I could fulfill a need meant that I had to put myself in my target customers shoes, and for you to become an influencer; you must also do the same. I have two target customers, and the way the would interact with me on Twitter is very different, and because I know this, I know how to communicate with them. Let me introduce you to Rita and Sue. Rita is a creative entrepreneur and visual in her approach to business and lifestyle. She’s passionate and inquisitive, always asking questions before making a decision to buy a product or service. She calls her friends on the phone, and searches with Google and through social media. Rita’s way of finding answers is through going to Twitter, searching for a brand and asking them a question. What Rita was looking for: A great customer service outlet, helping her make her purchasing decision. Sue is more analytical and methodical when it comes to a home and work/life balance. He’s more interested in facts and figures than Rita, but like Rita, he talks to his friends and uses Google to gather information. He will go to Twitter to find relevant content with statistics and facts that help him make his decision. What Sue was looking for: Content that provides facts, statistics and strategies to help him make his purchasing decision. By taking the time to understand how my target customer thinks, and how they use Twitter, I have been able to connect, engage in a two-way conversation, build my following and earn their trust which in turn builds my personal brand and online influence. Twitter has always been the network I would give to someone as a way of connecting with me online. Twitter also became the place where I shared all of my content, and built my own tone of voice. As I have evolved as an entrepreneur, I have realised that I have become more personal, and have shared more of my life with my audience than most other influencers I know. Doing this has definitely contributed to becoming a top 100 digital influencer because people buy from people, and having my own unique and personal tone of voice has definitely heightened my engagement, and increased my reach over time. Every single company that connects with their customers online that has a website and a successful marketing strategy will have their own tone of voice that connects with their customers. People will always buy from people, so your brand has to have emotion, and a personality which they can connect with and relate to. I used my tone of voice which I had developed through engaging on Twitter, and used this through my content. Doing this increased my engagement dramatically as Twitter users were sharing my content on a regular basis with their audience and this caused a snowball effect. I was (and still am) being asked to guest-contribute on authoritative websites including Social Media Today and Social Media Examiner. The more content I wrote, the more engagement I received on Twitter which of course contributed to the study that was conducted by Brand24. I was a small fish in a big pond and evolved into being a big fish in a big pond and this is because I truly understood the importance of having a unique tone of voice. Twitter has an amazing search functionality, but to really become an influencer online, you do need to understand how hashtags work. When I first looked at Twitter, and using it as a key marketing tool, I did my research, and looked at how hashtags were being used by my target audience. As the online world has evolved, the tools I use now are more advanced than those I originally used. Tagboard has been a great tool for me when looking at the hashtags my audience are using. To be recognised as a digital influencer means having a large reach, and reaching new and potential prospects can be achieved through hashtags. I understood early on that using the likes of #Marketing, #SocialMedia and #BusinessGrowth would be key hashtags for me, especially when sharing content. I also looked at what thought leaders in my industry were doing and from that I learned that there was a fine line between using too many hashtags, and not using any. I realised that for maximum reach, I was to only use between one and three hashtags. As great as it is to have hashtags in your tweets so that more people can find you, you’re tweets still need to be readable, and not seen as “spam”. Knowing your target customers, understanding your tone of voice and using hashtags are just three of the many important ways I have used Twitter to become a global influencer. How would you like to find out more? In my webinar, I will share with you how I have become a verified Twitter user, and amassed a following of over 32,000 business owners. Twitter is one of the most influential social networks, and if building your online identity, and growing a business is important to you, Twitter must be one of the social networks you are using on a daily basis to engage with your target audience. In the modern world, every business needs to communicate with their customers through Social Media, and one of the best way to do this is through Twitter. Do you know how to use all of Twitter’s features? Are you happy with the engagement and traffic you are generating through Twitter? Do you know how to find your target customers on Twitter? If you answered NO to any of the above questions, this will be one of the best Twitter learning opportunities you’ll have this year, and it’s 100% free and certified! In just 60 minutes I will take you through my formula to Twitter success that has helped me generate thousands of leads, and can be attributed to a 6-figure income. Be sure to sign up for the recording below.